EVER IMAGINED WHAT IT WOULD BE LIKE TO WAKE UP TO THE MOST INCREDIBLE VIEWS OF AN ABUNDANCE OF GRAPE VINES PLANTED ACROSS THE STEEP SLOPES OF A DEVON VINEYARD? EARLIER THIS MONTH I ENSCONCED MYSELF WITHIN THE SURROUNDS OF A LUXURY LODGE, OPENING MY SHUTTERS TO THE MOST BEAUTIFUL AND FAR REACHING VISTA OF VINES. I SPENT MY DAYS EXPLORING THE SITE AND SURROUNDING COUNTRYSIDE, DRINKING ROSÉ AND LISTENING TO THE SOUNDS OF NATURE. The process of vinification may or may not be high on your agenda, though I am sure most reading this will hold your hands up to enjoying a glass of red, white or rosé. There is much to be said for finding a good local wine, especially as many of the grape varieties are so hard to grow in the UK. I’ve always adored vineyards – the beauty of the vines in the ever-changing landscapes, the continuing cycle of pruning and harvesting the grapes, traditional foot treading and the general process behind producing the bottled goods. I have stayed on many a vineyard during my travels, though in the UK, a stay amongst the vines is much harder to come by. 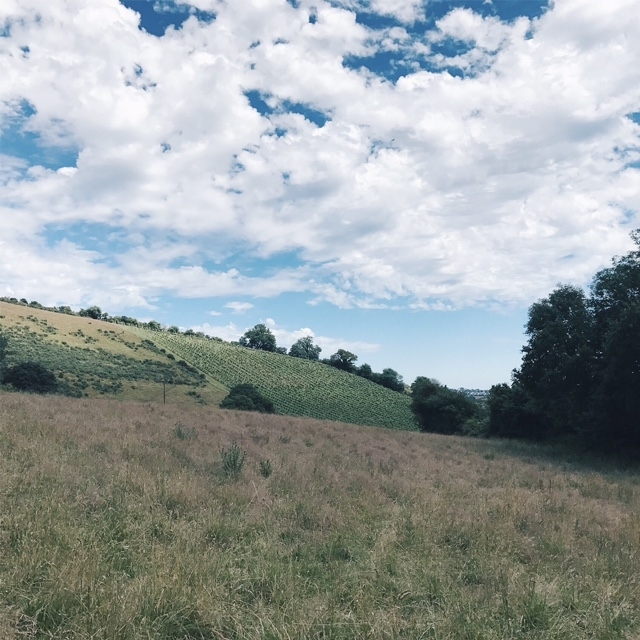 Old Walls in Devon however, is practically on my doorstep and when I heard about the plans to build six luxury lodges on site, I made sure I was top of the list to experience life on a vineyard first hand. The very first vines of Old Walls were planted in 2002, with the initial harvest taking place in 2004 and the first of the bottling ready to sell in 2005. The vineyard hasn’t looked back since, taking full advantage, year after year, of the south facing slopes and well drained soil. The lodges took ten months to complete and offer a completely unique experience to the working vineyard. Sitting neatly at the foot of the vines, with spectacular views across the expansive slopes are the perfectly positioned lodges. Each lodge sleeps four with one double and one twin bedroom, an open plan lounge, diner and kitchen along with a generous bathroom. There is also an outdoor decked patio with seating and private screened and paved barbequing area with a built in brick barbeque for alfresco dining, as well as a storage shed for bikes. Each lodge is fitted out the highest standard with all mod cons such as central heating, wine cooler, fridge freezer, hob, extractor fan, flat screen TV and wifi, offering a real home from home retreat. The roofs are made from natural slate and the reinforced concrete bases are faced with brick. The actual structures of the lodges are made of high-grade stress tested timber with a manmade cladding on the outside, and thickly insulated internal walls to keep the heat in out of season. If there is ever an earthquake in Bishopsteignton, the lodges will be the only six buildings standing, with the footings for each being enough to support a skyscraper. Staying at the vineyard is indeed a serene existence. Floor to ceiling glass-fronted windows offer the feeling of being fully ensconced in the vines, making for a truly immersive experience. The lodge itself is beyond peaceful, with the only sounds being the rustling of the vines and the staggering wildlife, including badgers, foxes, various wild birds and deer that make their way down the hills and across the vines at dusk. The breathtaking views from the top of the vines are well worth the steep hike, offering the perfect place sit and contemplate how to spend your day. I spent my mornings indulging in late alfresco breakfasts at the foot of the vines and walking Partridge to the top of the sites steepest slopes and rolling hills beyond. My afternoons were filled with leisurely reading sessions, Wimbledon matches and writing in front of the floor to ceiling window, exposing nothing but endless vines. Evenings were enjoyed over barbeques on the secluded patio, with a bottle of Old Walls finest and the kind of sunsets you want to frame. Old Walls still is and will remain, a working vineyard. Guided tours of the entire winery along with a talk on the vinification process are offered three times a week between April and October. These have proved to be popular with guests and visitors alike, adding to the overall experience of staying on a vineyard. 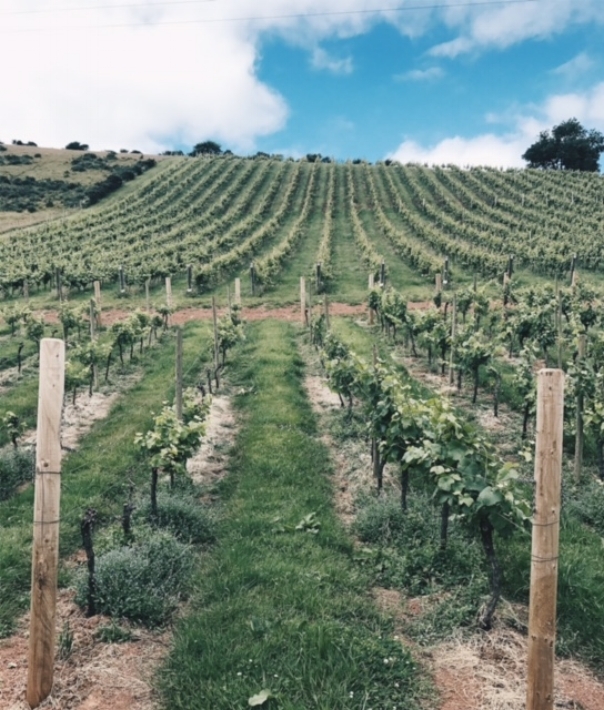 The site produces a selection of Devon wines, perfect to accompany alfresco dining at the vineyard, including four whites, two sparkling whites, two reds, an elderberry, light red and a rosé. So far this year, it is looking likely there will be a good harvest, unlike many UK vineyards that suffered badly at the hands of late frosts, the vines at Old Walls have been unaffected, though the outcome of the crop won’t be certain until later in the year. The process of vinification is one that I find forever fascinating – from the pruning and the harvesting of the vines to the laborious foot treading method of crushing grapes and the bottling, ready for drinking. Immersing myself within life on a vineyard was a blissful experience I will be sure to miss. I left Old Walls feeling restored and energized, my taste buds sated with the plentiful varieties of grapes and a vision of vines imprinted on my mind. 1. Research which vine suits your soil type and decide whether you want to produce red, white, rosé or sparkling wine. 2. Erect trellising to suit both the area and the vine. 3. Plant the vine in late autumn or early spring. 4. In the first couple of years remove all the flowers from the vine so that the root system can establish itself. 5. Throughout the growing season, spray the vines every seven to ten days to protect against mildews. 6. Harvest time is between September and October, depending on the amount of sunlight during the growing season. 7. Pruning the vines happens between December and February when the vines are dormant. 8. Pruning depends on which trellising system is used. Up to 90% of the years growth is removed, ready for the season to start all over again.